Z tej okazji w dniach 20 – 21 kwietnia 2018 roku oraz 12 – 14 maja 2018 roku pracować będą z Polski stacje HF70I , 3Z70I i 3Z70ISRAEL. W ramach pracy tych stacji amatorskich wydawany będzie dyplom 70 LAT NIEPODLEGŁOŚCI IZRAELA. Dyplom będzie wydawany w wersji elektronicznej bezpłatnie oraz w wersji ozdobnej deski przesyłanej zdobywcy po dokonaniu wpłaty określonej regulaminem. 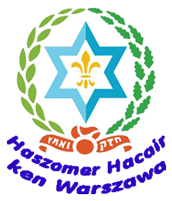 In 2018, we will celebrate 70 years of the proclamation of the independence of the state of ISRAEL. David Ben-Gurion (דוד בן גוריון, born David Grün, דוד יוסף גרין, in Płońsk, Poland), announced the Declaration of the Independence of Israel (הכרזת העצמאות) in Tel Aviv on 14 May 1948. To commemorate that event, the following special-event stations: 3Z70I, HF70I, and 3Z70ISRAEL will operate in Poland on 20-21 April and 12-14 May 2018. QSL via SP5PDB. 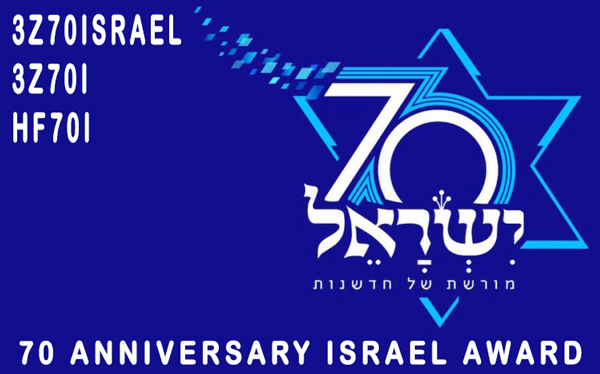 The 70 Years of the Independence of Israel Award will be issued for contacts with those stations. 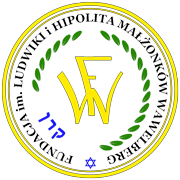 The Award will be available either in an electronic version free of charge, or in the form of a Trophy upon payment of the fee specified below. 1. Making QSO’s (or HRD’s by SWL’s), any band, any mode, with at least two of the following stations: 3Z70I, HF70I, and 3Z70ISRAEL. 2. Electronic Awards will be issued automatically on the basis of the logs submitted by the 3Z70I, HF70I and 3Z70ISRAEL operators, and the winners will be able to download their Awards from the organiser’s website. 1. Operators: work 3Z70I, HF70I and 3Z70ISRAEL, any band, any mode. 2. SWL’s: log 3Z70I, HF70I and 3Z70ISRAEL, any band, any mode. 3. Pay a fee of either PLN 60.00 to this account: 51 2130 0004 2001 0607 1815 0001, or 35.00 euros to this account: IBAN PL51213000042001060718150001, SWIFT VOWAPLP1.